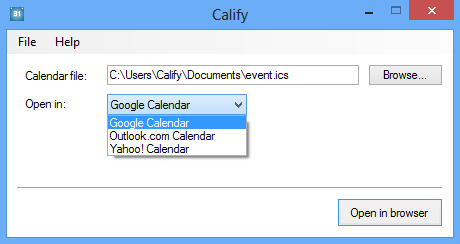 Calify allows you to open calendar files and event invitations in a variety of web calendars. Double-click an *.ics file and see it open in, e.g. Google Calendar. Automagically. Multiple web calendars are supported, including Google Calendar, Outlook.com Calendar and Yahoo! Calendar. Installation creates a system wide file association for iCalendar files (*.ics). Calify can also look for ticket listings for public events. As a vivid user of Google Calendar, I have always lacked the ability to open event invitations or calendar files directly in Google Calendar.